The day after I had my second baby, the paediatric resident came around and offered to give him one of his vaccinations. "Will it make him cry?" I asked, and when she said maybe, I told her no way, I would totally fall apart if he cried at that particular moment. She looked at the totally placid baby, and me, sitting calmly in the recliner, shrugged, and told me to get it the following week. I sure we looked fine, but it was tenuous. Freaked-out crying jags were kind of my thing right then. Nothing knocks you for an emotional loop like having a baby. For me, the feeling of constant, guarded apprehension passed within a couple of weeks. For other women, new-mother worries can mushroom, dominating their thoughts and blotting out all the joy in having a new baby. Where it gets confusing is knowing when ordinary "baby blues" (which should pass) shades into ongoing depression, or when mild nervousness ("Should he wear a jumper?") turns into intrusive, terrifying thoughts about, say, your baby freezing to death. 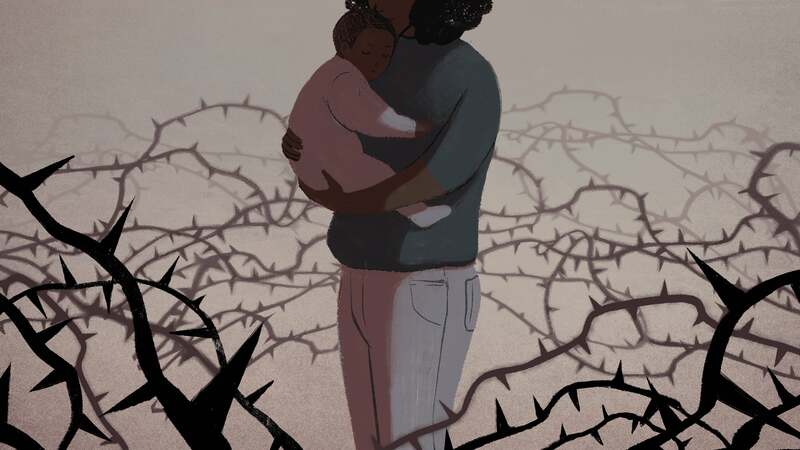 To get an idea of how to distinguish between ordinary new-parent worries and postpartum anxiety, I spoke to Christene Raines, a psychiatric nurse practitioner who has worked at the Perinatal Mood and Anxiety Disorders Program at the University of North Carolina for the last 12 years. Please note: If you are experiencing anxiety or depression in the postpartum period, please speak to your health care provider or call Postpartum Support International's "warmline", which will connect you with resources for help. Australians can also contact the PANDA National Helpline on 1300 726 306. If you are thinking about harming yourself or your child, go the ER immediately. "I hesitate to use the word normal, because nothing is 'normal' in the perinatal period," she said. "There's a really fine line here. In the definition, perinatal anxiety should resolve within two weeks, but that's obviously not always the case. Things don't always go the way they're supposed to go, and it doesn't necessarily mean that [the mother] needs treatment." New parenthood is an inherently anxiety-provoking stage of life, and "new parents are always going to have that fear of the unknown". Nonetheless, there are symptoms that Raines looks out for that would indicate a mother needs help. There are a few rules of thumb Raines uses to determine if someone needs support or treatment for postpartum anxiety. "When anxiety begins to interfere with your daily activities, when it's controlling your life more than a fleeting anxiety would - that's my go-to [criteria] for when I decide to treat." If you're afraid to go outside or let the baby out of your sight, for example, that would indicate your anxiety has spiked to unreasonable levels. And if the anxiety has persisted for more than two weeks, she says, "It's important to talk to your provider about what's going on." It's normal to have worries, say, about whether a baby (especially a breast-fed baby) is getting enough to eat, but if those worries become all-consuming, if you're sitting up all night watching the baby instead of sleeping when the baby sleeps, for example, that's when Raines gets concerned. "What we find with perinatal anxiety is intrusive thoughts," says Raines. "The mother worries, 'What if I fall down the stairs and drop the baby?' But it's the visualising of that that's abnormal." Most mums will have fleeting fears, like the baby slipping under the water during a bath, but be able to move on after reassuring themselves that it's not likely and they're taking care. "But it can get to a point where they can't think of anything else," says Raines. They can't stop visualising the baby drowning. (I had a friend whose husband lifted the baby over his head towards the ceiling fan - but nowhere actually near the ceiling fan - and she couldn't stop visualising the baby caught in the fan rotors.) "They can't function any more - they can't drive the car because what if the baby cries? What if they have a wreck?" This is a major sign that a new mother should seek help. Raines describes a patient of hers for whom she did a home visit: "There was bottle of Purell on every table of her house. Everywhere you took a step, you had to Purell your hands." She had another patient who was marine biologist; the woman became obsessed with the idea that amoeba would travel up her nose and eat her brain. These things sound absurd to the outsider, of course, but are a source of ongoing misery to the anxiety sufferer - after all, can anyone promise you an amoeba won't eat your brain? That you won't have a wreck while driving the baby around? Another common anxiety is a "preoccupation with something bad happening," says Raines. "A preoccupation with your husband dying, or that someone will come in the window and take the baby. It can be a dark circle of spiralling downward." I asked Raines for her number-one red flag. "The thing that frightens me is when a patient says she hasn't slept in three days." Sleep is obviously a tricky issue for people with newborns, especially if you're nursing and/or don't have a a lot of support, but if you can't sleep at all, for days, not even when the baby sleeps, "that makes the hair on the back of my neck stand up," says Raines. "The majority of psychotic patients I see, that was the precipitating factor - they stopped sleeping." Other things to look out for: When the mother starts to say things such as "You all would be better off without me," or "This baby would be better off without me," or "I'm not the right mother for this baby." Raines says, "It doesn't necessarily mean that she's psychotic or that she needs to go to the hospital, but she is starting to detach," and that requires attention. "Or if she's not bonding with the baby, not wanting to care for the baby at all. This isn't a danger red flag, but she needs help." Finally, Raines says she worries when there's any behaviour that's very out of character, or "bizarre conversations". She references a patient who took the baby for a checkup and then stopped at the store for 11L of ice cream - the woman's husband said this was totally out of character for her. Or if someone who isn't especially religious starts to use a lot of religious references, if they're talking a lot about God or Satan - for example, "This baby is just Satan inside of me." "If that's not their norm, that would make the hair on the back of my neck stand up," says Raines. This can be tricky for family members or partners, especially if the mother is irritable or angry. Raines suggests asking her to talk to her health care provider, or looking for help at Postpartum Support International. (And again, if it's an emergency and you're worried the mother might harm herself or the baby, go to the hospital.) There are inpatient hospitals, such as the one Raines works at in North Carolina, and medication, but Raines stresses that "most women just need someone to talk to", and that medication is not usually the first line of defence. "We start with education - this is a time-limited problem. We let them know they're not alone, that's there help, and that this is a result of a fluctuation of hormones. Cognitive behavioural therapy can help reformulate [obsessive or intrusive] thoughts." Perinatal anxiety ranges from mild to severe, and mothers on the mild end of the spectrum benefit from getting out of the house, any amount of exercise, and social interaction. Raines recommends exercise classes for new mothers; often many gyms have childcare or parent-and-baby exercise classes. At the very least, she suggests walking to the mailbox every day - even a little exercise and fresh air can help stave off anxiety and depression. And eat and drink regularly: Raines reminds new mothers to have a high-protein snack, such as a cheese stick or some almonds, every time they feed the baby, because low blood sugar can exacerbate anxiety. The most important thing, Raines says, is to find a safe place to talk, and to know it will get better: "Women hear all the scary things, and not enough of 'It will be ok. It will get better. There are resources.'"